Hello! It's Allison from Stuckey in Second! 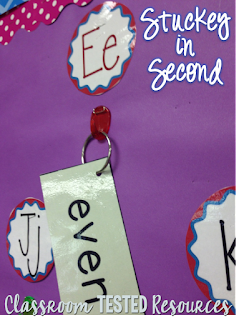 Today I'm going to share a quick teacher tip for your word wall. I just discovered these awesome hooks that I'm going to share and started using them a few weeks ago for my new word wall. I have limited bulletin board space in my classroom and it's hard to have a full "wallpapered" word wall. I say "wallpapered" because although I've had a word wall every year, it truly ends up being wallpaper on the classroom wall. Unless it's in the perfect location for all students to see and use, which seems impossible, I'm not sure that it's as useful for the class as we all hope it will be. I have seen many people put words on rings before and I used to think that wouldn't work well because they couldn't SEE all of the words. Well, guess what? They couldn't see all of them before and even if they could, they weren't using them!!! So....time to try something new! After seeing many people put their words on rings, I decided to give it a try, especially because my space is so limited, this seemed to be the answer! The good thing about the rings is that kids can come and take the ring of words to their desk to use. They can actually USE the word wall...and you KNOW they will if that means they get to go TAKE a ring of words off of the wall and bring it back to their seats!! The exciting part of all of this is that I was assuming I'd use something like thumbtacks to hang the rings, but without trying it, I kept picturing the rings just pulling the thumbtacks out constantly and quite possibly driving me crazy. 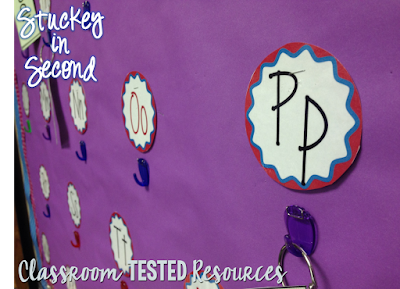 In my head, I was picturing using Command hooks, but didn't want to "stick" them to my bulletin board paper, but I was prepared to do what I had to do. I decided to go check out the thumbtacks in the office supply area of a local store. I wanted to see if maybe they had something slightly bigger that might be sturdier, but still in my head thinking that I needed Command hooks, and I'd have to deal with sticking them to my bulletin board paper, possibly ripping the paper... THEN I FOUND THEM! 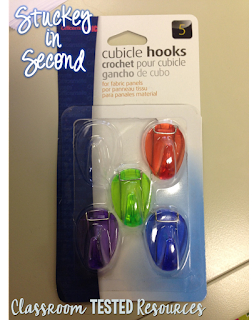 These "cubicle hooks" are the greatest invention and they are amazing!!!! Look closely. 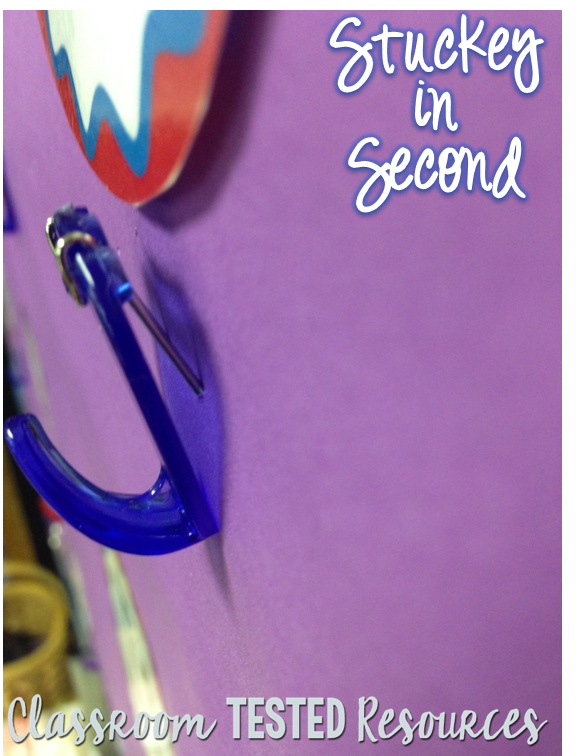 They are better than thumbtacks, not only because they have a hook, but because of the angle that they go into the bulletin board. They don't go in at a 90 degree angle like a normal thumbtack would. (Those of you living in the Midwest, I found them at Meijer, but I've heard they are available at big office supply chains too.) I got them for $1.99/5 pack and I see them for that same price on the Office Depot website. Unfortunately, I can't find them very cheap on Amazon! This picture shows the angle at how they go into the bulletin board. I've pulled it out slightly for the picture to show you. Once you push it all the way in, it's flush against the bulletin board! Here is how my word wall looks as of today, a few weeks into school! Obviously, we don't have many words up yet. I introduce ten words per week, we practice them, use them on spelling lists, etc. Then, I add them to the word wall rings. I'll have to try to remember to add another picture of it at the end of the year! I'm loving it so far! It's great for a small space and I know it will be easily utilized by my students! 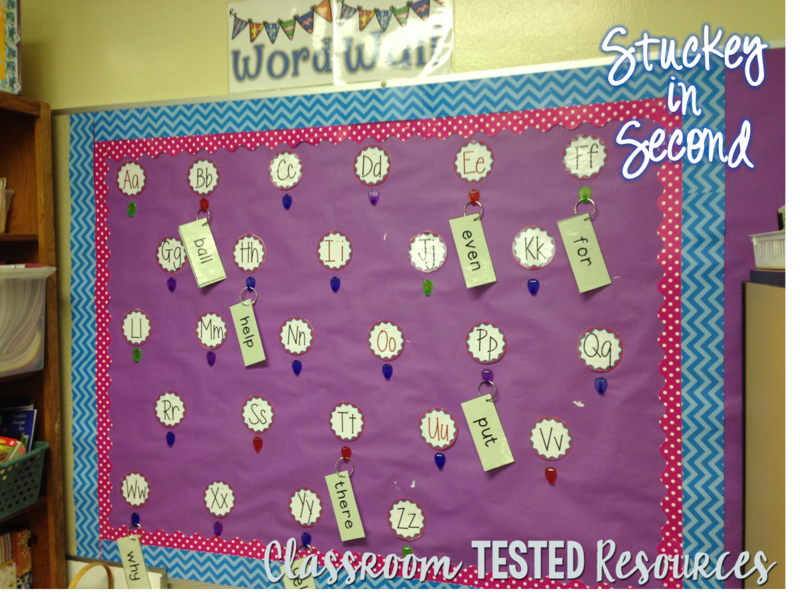 If you'd like a free copy of my WORD WALL SIGN and other classroom signs that I use, click here.